The Bizarre World of Frank Zappa tickets at London Palladium, London. 2019. Find the best The Bizarre World of Frank Zappa concert tickets at London Palladium, West End. The Frank Zappa hologram tour has recruited its band of former Mothers for this monumental series of shows. The touring unit itself boasts guitarists Ray White and Mike Keneally, bassist Scott Thunes, multi-instrumentalist Robert Martin, Ed Mann and drummer and Zappa archivist Joe 'Vaultmeister' Travers. Hours of never-before-seen Zappa performance footage from the early seventies will form the basis of the concert spectacle. 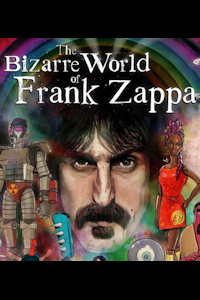 The tour is produced in close cooperation with the Zappa Family Trust. The Bizarre World of Frank Zappa website. Performers Ray White, Mike Keneally, Scott Thunes, Robert Martin, Ed Mann, Joe Travers.. The Bizarre World of Frank Zappa tickets: The tabs above allow you to select between links to suppliers and date searching. Click on a supplier's logo to see their details and on the 'buy now' button to see and check the tickets on offer.